I. Two zones topology , share nothing between each zones. But combine two instance network in same network segment. Zone1 using 192.168.1.0/25, Zone2 using 192.168.1.128/25 . We do not using floating ip. Let instance route from Core Network Switch directly. II. The difference from first diagram is Storage related openstack service. Two zones use one Glance + OBJ + Volume controller. III. The communication of these virtual cluster. After rewrite firewall.py and restart libvirt and nova-compute .. the Virtual IP is working now. Delete line 214-216 , It's not a regular way. but faster for us in our internal cloud. A better solution , plz check the QA link. 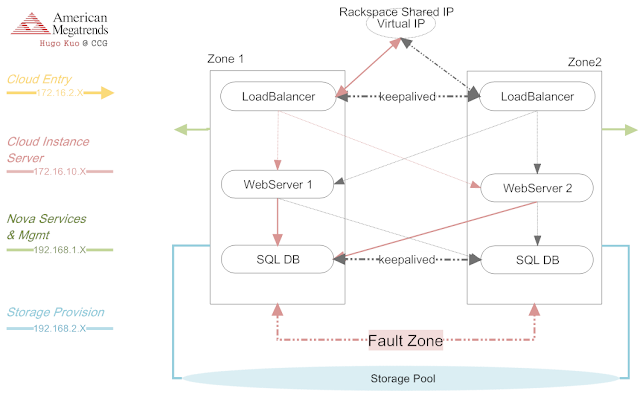 There're two ways for Cloud DB server. Great post Hugo. Very interesting. 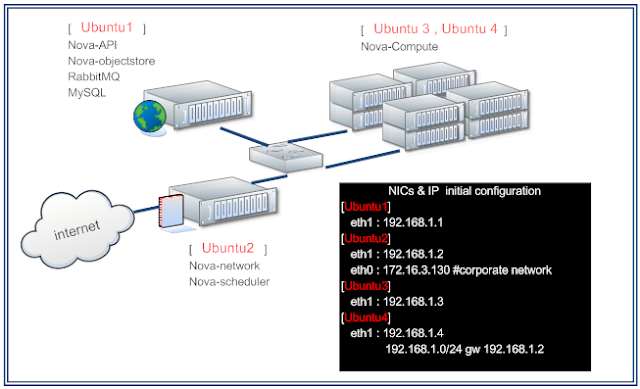 You should write about your experiences trying to setup a nova network service in High Availability: active-active, active-passive, clustered nova network services... I have read about your progress in the mailing lists and launchpad and I think you can gather all your research in a great post! In this post , it's not a NOVA service layer HA. I'm not sure if this approach could be use for a public cloud , But I believe it's useful for a internal private cloud. I got some idea about nova-network HA solution , but have no time to test that. I'll do it later. 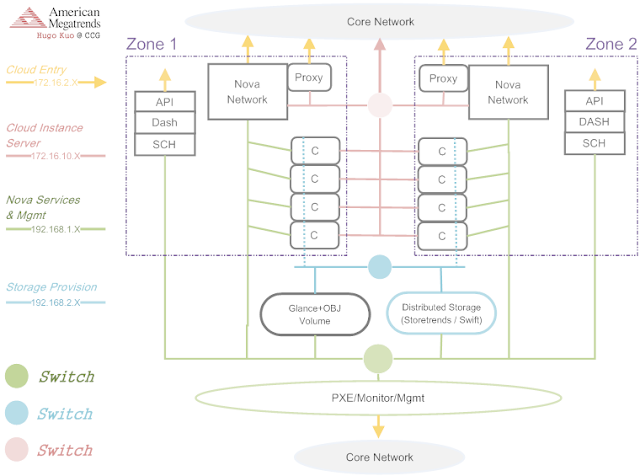 There's a blueprint about Nova-network HA (by NTT PF Lab), It's almost same with the idea in my mind. I'm focus on Active/Active. But really hard to implement. I will build a NOVA as this post for our team first. The custom image will be pre-set route from other gateway instead of nova-network. Another consideration is to inject network-configuration file into instance and route from other pure gateway(physical or software), But floating ip feature will lose. Hugo, "Storetrends" in your diagrams appears to be a generic storage system. I gather it is a reference to American Megatrends "StorTrends". In your diagram is this a SAN? NAS? iSCSI? or something else? JBOD?